This Valpolicella comes from the historical Tommasi family vineyard of the same name. Perfectly situated on one of the region’s most famous hills, Monte Masua, it produces what may be the best grapes for the production of Valpolicella Classico Superiore. Careful cultivation of the vineyard, a rigorous selection of grapes and meticulous vinification all contribute to the production of this fresh, elegant Valpolicella. A blend of 60% Corviña, 25% Rondinella and 15% Molinara, it sees 15 months of aging in large Slavonian oak casks of 65 hl. The aromas recall dried spices, leather and cherry and the flavors are intense, with spicy, sweet cherry flavors. 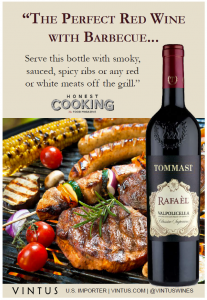 Beautifully balanced and very expressive, Rafael pairs wonderfully with a platter of cured meats and cheeses. 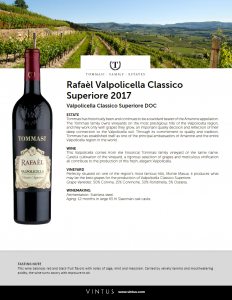 This Valpolicella comes from the historical Tommasi family vineyard, Rafaèl. Perfectly situated on one of the region’s most famous hills, Monte Masua, it produces what may be the best grapes for the production of Valpolicella Classico Superiore. Careful cultivation of the vineyard, a rigorous selection of grapes and meticulous vinification all contribute to the production of this fresh, elegant Valpolicella. It sees 12 months of aging in large Slavonian oak casks of 65 hl. This wine balances red and black fruit flavors with notes of sage, mint and marjoram. Carried by velvety tannins and mouthwatering acidity, the wine turns savory with exposure to air. This easy drinking red is a pure expression of Merlot from Northeast Italy with mineral tones as well as flavors of plump cherry, blackberry jam and almond. Le Prunee is a single-vineyard Merlot grown at the Prunea estate in the Sant’Ambrogio valley of Valpolicella Classica. Arele is a perfectly balanced example of the appassimento style, with concentrated flavors and full body that nonetheless does not overwhelm, thanks in part to the Tommasi family's use of exclusively Slavonian oak. This 100% single-vineyard Garganega is a perfect representation of the Veneto's defining white wine. Though a pure pleasure to drink on its own, the wine's moderate acidity, elegant perfume and high concentration of aromatic compounds makes it a versatile paring wine as well. Le Fornaci hails from Lugana, a trendy, growing appellation on the southern shores of Lake Garda. Tommasi has long owned an estate in the village of San Martino della Battaglia, where they produce elegant white wines made from the indigenous and largely unknown Turbiana grape. Ca' Florian is the feather in the cap of the Tommasi family's production in Valpolicella. Amarone Riserva “Ca ‘Florian” is made with selected grapes from one of the oldest vineyards owned by the Tommasi family. The grapes come from vines with an average age of 30 years. This wine is made by refermenting the juice from the Valpolicella on the warm Amarone grape skins, in the typical “Ripasso” method, which imparts a rich character and personality to the wine. 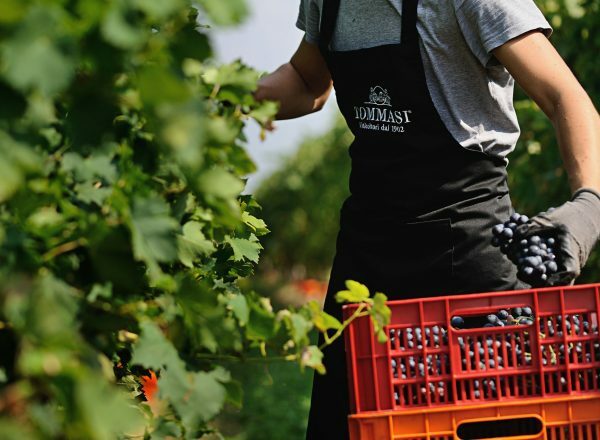 The grapes for the Ripasso Valpolicella are sourced from three of most prestigious Tommasi vineyards: Conca d’Oro, La Groletta and De Buris. Tommasi's traditional approach to Amarone favors elegance and balance, with deep fruit complemented by spicy, earthy flavors. The grapes come from the family’s choicest plots in the Valpolicella Classica region. 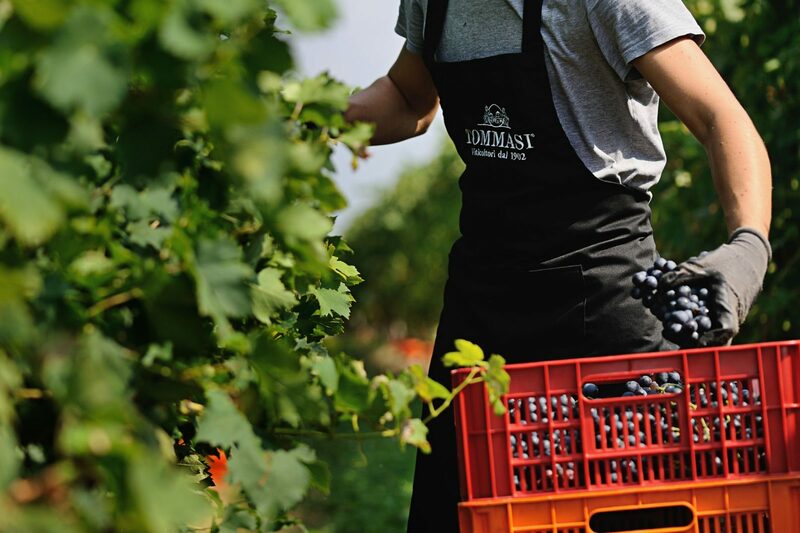 Through its commitment to quality and tradition, Tommasi has established itself as one of the principal ambassadors of Amarone in the world. Tommasi's Pinot Grigio is grown at the Prunea estate in the Sant'Ambrogio valley of Valpolicella Classica. Le Rosse is one of the four main sub-plots of this vineyard, and is planted entirely to Pinot Grigio grapes. This Valpolicella Pinot Grigio can be described as sitting between the richer, more concentrated Pinot Grigio from Friuli to the north, and racier styles from the Veneto at large. The nose is spicy with hints of tropical fruit, the flavors clean and crisp, and the body round and soft with a crisp finish.